Product prices and availability are accurate as of 2019-04-25 18:45:10 UTC and are subject to change. Any price and availability information displayed on http://www.amazon.com/ at the time of purchase will apply to the purchase of this product. 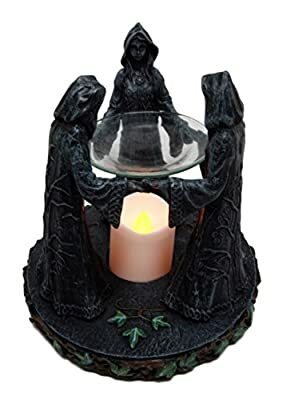 This Triple Goddess Candle Holder Oil Diffuser is a beautiful piece of Wiccan Decor that is both functional and wonderful to look at, ensuring your home reflects your Wiccan beliefs! It can be used in a varirty of ways and glass positions and can hold candles, or warm and diffuse your essential oils, waxes and melts. It is a quality piece from Ebros and offers great value for money. 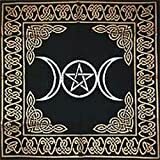 The symbol of the Triple Goddess has been adopted by many neopagans as one of their primary deities. 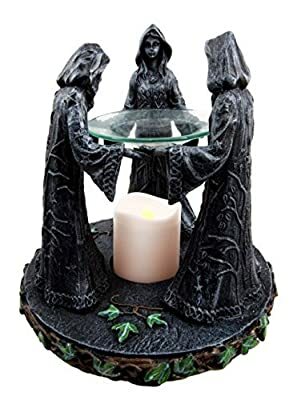 In common Neopagan usage the three female figures are frequently described as the Maiden, the Mother, and the Crone, each of which symbolizes both a separate stage in the female life cycle and a phase of the Moon, and often rules one of the realms of earth, underworld, and the heavens. These may or may not be perceived as aspects of a greater single divinity. The Goddess of Wicca's duotheistic theology is sometimes portrayed as the Triple Goddess, her masculine consort being the Horned God. 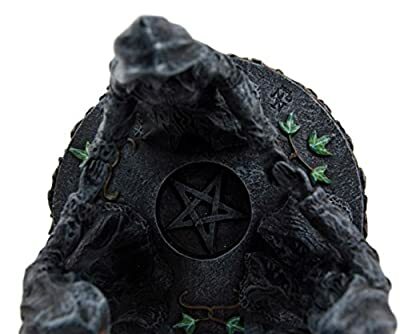 This amazing Triple Goddess Candle Holder Oil Diffuser figurine measures 5.75" tall, 5.75" long and 5.75" deep approximately. It is made of designer composite resin, hand painted and polished individually. Color tone may vary from pictures. Tea light candle/Oil/Wax not included. The Maiden represents enchantment, inception, expansion, the promise of new beginnings, birth, youth and youthful enthusiasm, represented by the waxing moon. The Mother represents ripeness, fertility, sexuality, fulfilment, stability, power and life represented by the full moon. 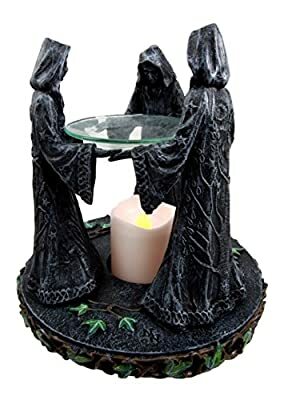 The Crone represents wisdom, repose, death, and endings represented by the waning moon. 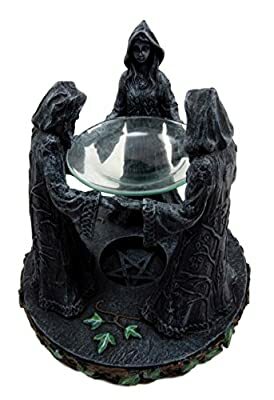 This all in one triple goddess candle holder and oil/wax warmer diffuser captures the very concept of this Wiccan belief. 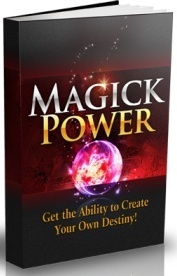 Light a tea light candle or diffuse aromatic oil with the figurine and bring the wiccan power to your surroundings. This figurine can be displayed two ways; with the glass dish on top of the hands as pictured or at the base of the feet.